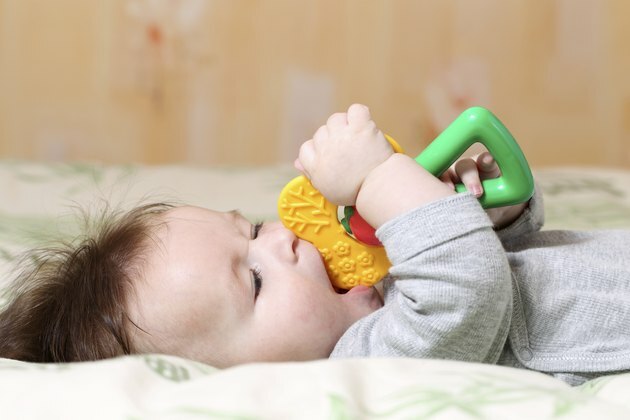 Teething is a natural process, starting around 3 months of age, but it still causes distress for some babies. Various physical symptoms herald the start of the teething process, but they are usually directly related to the affected area. Babies do not get illnesses from teething, even though the symptoms might make them feel miserable. Teething does not directly upset an infant's stomach. Symptoms directly caused by teething do not include an upset stomach. Drooling is a common sign of incoming teeth, and the moisture often triggers coughing and a facial rash. Babies get uncomfortable as teeth get ready to erupt, making them cranky and hard to soothe. The mouth pain often keeps infants awake and makes it hard for them to feed. Ear- and cheek-pulling are signs of discomfort, and teething youngsters bite and chew excessively. Teething babies sometimes develop upset stomachs and diarrhea even though digestion has nothing to do with erupting teeth. Drooling may actually cause the problem, since infants swallow much of the excess saliva. The volume of liquid may upset the stomach and cause watery stools. Fever is another sign not directly related to teeth coming in, but teething babies may develop an increased temperature as a side effect of gum inflammation. Treating your baby's teething signs and symptoms helps reduce drooling and the chance of an upset stomach, as well as other unpleasant effects. Rub your baby's gums to ease the pain, either with a clean, damp cloth, a piece of gauze or a bare finger. Using a cooled cloth is especially soothing, and you can also offer refrigerated applesauce or yogurt to youngsters who are old enough to eat those foods. Non-aspirin over-the-counter pain relievers ease discomfort. Problems, such as an upset stomach -- possibly indicating a more serious illness -- may happen coincidentally with teething. Monitor your baby closely if he has an upset stomach with symptoms such as diarrhea and vomiting, as medical treatment may be necessary. Possibilities include anything from an infection to food poisoning, notes Dr. William Sears of the AskDrSears.com website. Call your child's pediatrician if the problem does not clear up within a day or two.